Some of the most well-known brands in the U.S. retail industry disappeared from the retail landscape forever in 2008 and 2009 when consumers stopped spending, and many have struggled to survive in the ultra-competitive, post-recession environment. 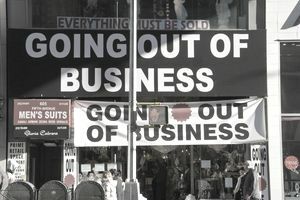 Large retail chains such as Borders, Circuit City, Blockbuster, and some of the oldest retail chains like Boscov's filed for bankruptcy and disappeared from the U.S. retail landscape much to the surprise of American consumers and retail industry experts. During the Great Recession, a national commercial real estate investment firm, Madison Marquette, assessed the stability of the largest U.S. retail chains, and ranked these retailers based on their risk for bankruptcy in the short term. An overview of the list is below, arranged according to the level of bankruptcy risk that Madison Marquette believed was appropriate for each company based on an undisclosed combination of criteria. Although this Retailers at Risk for Bankruptcy list below was published in 2009, it has current retail relevance as a comparison tool. For instance, the Chico's retail chain was identified as being at high risk for bankruptcy in 2009. Five years later, the Chico's retail chain didn't file Chapter 11, but it did close 120 of its retail stores in order to avoid ending up in bankruptcy court in 2015. Talbots avoided a trip to bankruptcy court by selling off its JJill brand. Four retail chains that were assessed to be "moderately" at risk for bankruptcy: Borders, Blockbuster, Brookstone, and Cache did, however, visit Chapter 11 bankruptcy court and never made it out alive. All four of these retail chains have been liquidated since 2009. The duration of the retail recession and the strategies that company leaders used during that time kept these major U.S. retail chains off the high-risk list above and on the low-risk list below. These are the retailers that struggled to find firm footing in the worst industry-wide retail recession in American history since the Great Depression: Some of them gained traction and some of them did not, and some of them are still looking for stability almost a decade later. These retail companies either thrived in the recession economy or rode out the economic disruption with relative comfort. Although same-store sales for many of these companies in 2009 were considerably lower than they were in 2008, their cash reserves, credit lines, and expense management were sufficient during the downturn to keep them financially stable. Many of these low-risk retailers defied the recession by increasing sales, opening new store locations, and offering innovative products and value pricing. They responded to dramatically changing buying habits. These strategies helped these successful retail companies to capture the attention of discerning customers and strengthen loyalties despite price-motivated fickleness. The low-risk retail chains below were expected to be able to retain a significant position in the post-recession retail landscape, and some of these retail brands emerged stronger, bigger, and more powerful than they were before the global retail economy plummeted in 2008.